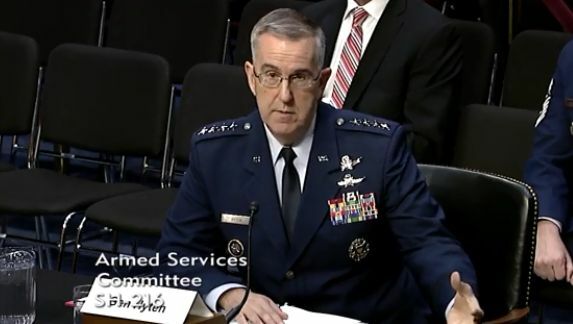 Gen. John Hyten, Commander, U.S. Strategic Command, testifying to the Senate Armed Services Committee, March 20, 2018. Screengrab. The issue of whether to create a Space Corps within the Air Force analogous to the Marine Corps within the Department of the Navy, or to go even further and create a new Space Force outside the Air Force, has become a hot topic over the past year. The House-passed FY2018 National Defense Authorization Act (NDAA) would have required creation of a Space Corps, but SASC opposed the idea and it was not included in the final NDAA. Instead, studies are underway on how best to organize DOD to implement space programs effectively. The leaders of the effort in the House, Rep. Mike Rogers (R-Alabama) and Jim Cooper (D-Tennesse) have vowed to continue their efforts and got a boost last week when President Trump asserted that he wants a Space Force. DOD, the Air Force, and the White House itself strongly opposed the idea last year. Trump’s statement clearly came as a surprise and civilian and military DOD officials have been struggling ever since to align their comments with their Commander in Chief. In a separate exchange, Sen. Joni Ernst (R-Iowa) questioned whether it is time for a new version of the 2011 National Security Space Strategy because so much has changed since then. Hyten replied that the services, the National Reconnaissance Office (NRO) and USSTRATCOM have already developed an “integrated strategy,” but it is so classified that few know about it. He said he would discuss it with SASC members tomorrow during a closed hearing, but stressed the need to determine how much actually must be classified. During an exchange with Sen. Ted Cruz (R-Texas) about Ballistic Missile Defense (BMD), Hyten expressed support for boost phase intercept. “I would love to drop a missile back on somebody’s head that launches it,” he said, but is “agnostic” on the technical solution. He strongly agreed on the need for a space-based sensor component for BMD, but “I’m not convinced, at this time, that space-based interceptors are required.” He said the upcoming Missile Defense Review will shed more light on that topic.